Diego Ferrer has worked in GVA since 2012 as a member of the senior management team and currently holds the position of Chief Financial Officer. He is responsible for managing the finances of GVA and its subsidiaries, as well as the group's investment portfolio. In addition to the finance department, he is responsible for the departments of accounting, human resources, legal (corporate) and technology. Ferrer is part of the Board of Directors of several companies in the group, including Wyndham Panama Albrook Mall and Verdemar Investment Corporation, S.A., as well as the Playa Dorada, The Reserve and Embassy Club / Embassy Village projects. Additionally, he is a member of the Board of Directors of Reprico, S.A. and the Editorial Board of the weekly newspaper Capital Financiero. Before joining GVA, Diego Ferrer served from 2010 to 2012 as Deputy Director of the Public Credit Directorate, as well as Deputy Director of the Directorate of Investments, Concessions and Risks of the Ministry of Economy and Finance of the Republic of Panama. In these positions, he executed transactions in the capital markets for over $ 1,500 million dollars, besides managing more than $ 1,200 million in financial assets and directing the team that designed the Panama Savings Fund (FAP), the sovereign fund of the nation. 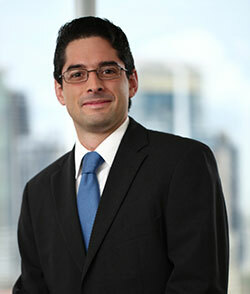 Early in his career, Ferrer served as an Economic and Commercial Counselor at the Embassy of Panama in Washington D.C. (2006 - 2009), and worked in Panama’s largest private bank, Banco General, from 2004 to 2006. Diego holds an MBA from IE Business School in Madrid, Spain (Beta Gamma Sigma), an MA in International Relations from the University of Louisville and a BA in Economics from McGill University, in Montreal, Canada.